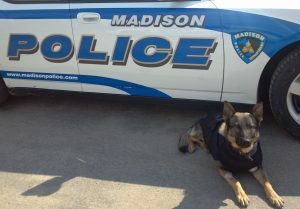 Protecting the Madison Police Department (MPD) K9s while they are serving our community is vital. The risk of a K9 becoming overcome by heat on a summer day, while waiting in a squad car, is acute. The heat alarm monitors vital components including temperature sensors and vehicle battery voltage. If an alarm condition is detected, the unit will activate the horn, siren, & flashing lights, as well as a duel window drop. The engine stall and “no K9 left behind” features are included. Click on the image below to access more details. To safeguard these dedicated members of MPD, heat alarms are installed in all of the K9 Unit squad cars. The heat alarm in K9 Falko’s squad no longer functions and must be replaced. 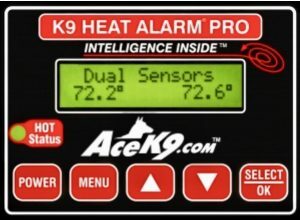 On GivingTuesday, November 28, 2017, Capital K9s launches an effort to to raise $1,000 for a new heat alarm. With your ongoing financial support, these K9s can serve our community in relative safety. The Madison Police Department’s K9 Unit is currently comprised of eight working dogs. Their training, equipment, food and veterinary care are provided by Capital K9s, which relies solely on donations to fund these initiatives. Be a part of the community that’s giving back to these loyal guardians who are dedicated to making our neighborhoods safe. Contribute to the Capital K9s on GivingTuesday via the link below.